— This tender story of family, friendship and acceptance teaches us that it really is a wonderful thing to "love who you love." Winner of the 2003 Outer Critics Circle Award for Best Musical, A Man of No Importance is the second successful collaboration by the team of Terrence McNally, Lynn Ahrens and Stephen Flaherty, all of whom won Tony Awards for Ragtime. Alfie Byrne is a bus driver in 1964 Dublin whose heart holds secrets that he can't share with anyone but his imagined confidante, Oscar Wilde. When he attempts to put on an amateur production of Wilde's Salome in the local church hall, he confronts the forces of bigotry and shame over a love "that dare not speak its name." But the redemptive power of theatre changes his life and brings his friends back to his side. 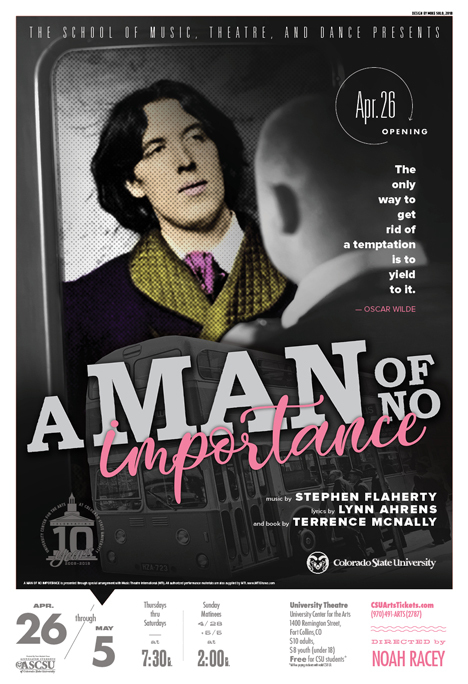 A Man of No Importance is a rare gem in the canon of musical theatre, one that combines the depth and drama of a play with the lyricism and comedy of a musical. A tender and beautifully woven tale of love, friendship and coming to terms with who we are that is sure to move and inspire your audiences. RESERVED SEATING: Seating begins 30 minutes prior to curtain. Patrons arriving after the start of the performance will be admitted at an appropriate interval and may be required to sit at the rear or side areas of the theater. Tickets will not be refunded for exchanged. WHEELCHAIR SEATING: Wheelchair and Companion seating is available in ROW A. ADDITIONAL INFORMATION: For information on all fees, box office hours, complimentary and discounted ticket programs and other important information, please use the links in the gold menu bar at the top of the page. The UCA Ticket Office is open 60 minutes prior to curtain time for 'in person' sales only and remains open until 30 minutes after the performance begins.